International fashion brand specializing in ethnic-inspired accessories offers its goods before the holiday. WASHINGTON – Nov. 7, 2015 – PRLog — International accessory brand Bijoot invites fashion-forward Washingtonians to the Washington Court Hotel near Capitol Hill on Saturday, December 5, 2015 from 2-4pm to shop and preview their latest collection. Handmade bags, jewelry, shoe clips (one of Bijoot’s more unique products), ties and bowties, pillows, home decor items and more will all be for . A new way to shop for quality handmade and ethnic inspired accessories was launched in July 2014. 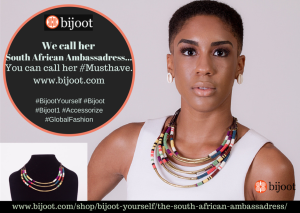 Bijoot, pronounced “B-joot” (be-zhüte) is an innovative, practical and versatile fashion brand inspired by the beauty of diverse cultures throughout the world. 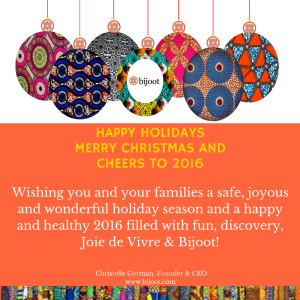 The Bijoot line captures the spirit of multiculturalism and satisfies the stylish urge of those who seek exotic, chic and eclectic accessories to infuse personal expression with la joie de vivre (the joy of living). .